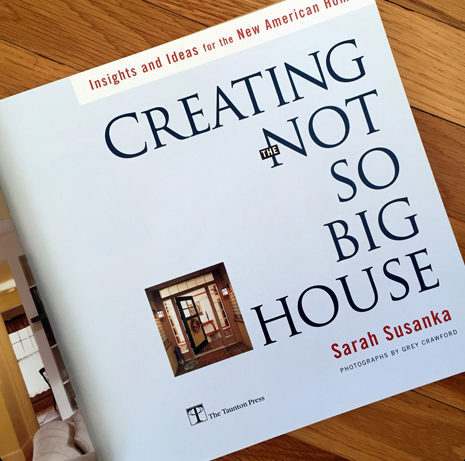 In Sarah Susanka’s ground-breaking book The Not So Big House, she spoke out against the McMansion trend, arguing that bigger is not necessarily better when it comes to designing our homes. You may recognize this house as one she featured in her book. It’s on the market in St. Paul, Minnesota, so let’s take a look! There was some confusion over the “Not So Big” term itself because a lot of people assumed it meant small. It’s not really about the size, though, but about what you focus on. She argued that it was more important to spend money on thoughtful details like woodwork and built-ins than square footage. 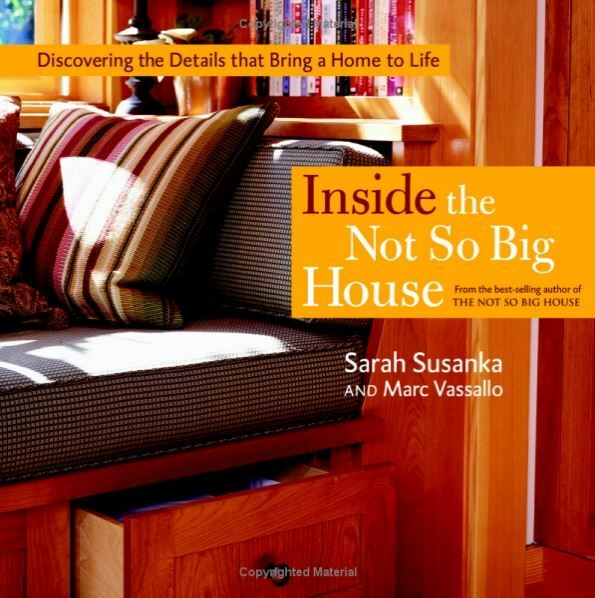 Designed and built in 1988 by renowned architect Sarah Susanka and featured in her landmark book The Not So Big House (thanks to its design principles, not because of size). Truly a tranquil, private retreat on 4.5 acres of wooded land, this remarkable home will delight with its panoramic views from every window and echoes of Frank Lloyd Wright and Asian influence in the architecture. When we built our house, The Not So Big House inspired me to make some changes to the plans. For instance, we nixed the builder’s plan to give us a two-story family room and created a second-floor playroom instead. We added more windows wherever possible, including a round one in a powder room that gave the small space a little more light and character. We really thought about the way we wanted to live in the spaces and how we wanted them to feel. We built a smaller house than we originally planned and put the money we saved on square footage into upgrades like a built-in butler’s pantry in an empty corner of the kitchen. One of the first posts I wrote mentioned Susanka and her books. Imagine my shock when she emailed me about it! I couldn’t believe she had seen my fledgling blog, let alone took the time to write me personally. I posted the thoughts she shared with me about using more thoughtful design in architecture here, back in 2008. The house sits on 4.5 acres. Thanks for this post! I think we discovered Sarah Susanka when she designed one of Life magazine’s dream houses many years ago. Her ideas about quality over quantity really resonated with us; we cut our plans by at least 1000 square feet and were able to add some lovely, homey details with the savings. Absolutely no regrets after 10 years and our project came in just under budget. The house is much cozier than it would have been, which I love because it means more family togetherness 🙂 It is so easy to go overboard with size when building! That house still looks pretty big to me. Where I live in NJ, McMansions were all the rage in the late 90’s and early 2000’s. It was quite popular to build 3000+ square foot homes on 1/4 acre lots. I guess some people liked them because they all sold quickly. Totally agree. This is a huge house. Over 5,000 sq ft? Even if it had been smaller, it still looks very spacious. Agree. It’s huge compared to my house, and I live in a California suburban ranch style house that is average size. I expected an actual smallish house. Don’t get me wrong though, it’s gorgeous. Love all that beautiful wood. My one real dislike is that tub in the master bath. Looks terribly uncomfortable with the steep square sides. How do you get in and out? I see that style tub a lot in photos of new homes. Absolutely love it! I have always preferred quality over quantity even though this particular home is still rather large. Totally refreshing! I’d like to see class return to our society no matter what price range one has to build with, it just takes more time to think about it. Stainless steel appliances and quartz counter tops don’t make a home. 5,648 sq feet is what I call a very big house. A huge house. It would be a lot of space for most of us. That’s why I tried to explain that the “Not So Big House” as a design concept is NOT about a specific size or building small houses necessarily. Many of the houses she features in her books are larger than a lot of us live in, for sure. I like your title better, because her title makes it seem as if it’s “back to normal-sized houses” or something along those lines. I agree, a house of over 5000 sq ft is a monster house. This is ridiculous. 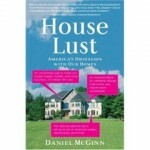 Just because this house doesn’t look much like cookie-cutter McMansions, it is (FAR) beyond what most of us need. I get spending your money on less square footage and better quality. THIS house has more square footage and lots of upgrades. Seems rather hypocritical to me. Totally remember that book! Cool you two spoke. Agreed about the McMansions. Really what interests me, anyways, is that my family members and I see each other once in a while. Done right – I’m a 1900 to 2300 sq. ft. girl. I like the concept, but using a beautiful 5600+ sq foot home to display that concept sort of rings hollow for me. I guess the takeaway should be that no matter the size home, there are improvements to tailor it to ones uses and tastes. HGTV should take note. I loved her books and ideas, but I don’t think the concept has “taken” with most people. And based on what I see around my area, the housing slump didn’t cure the McMansion craze either. Vast neighborhoods of giant vinyl-clad boxes are springing up again, and boy, are they ever ugly! We are nearing the end of a long construction process. I hadn’t heard of Sarah, but I think we are kindred spirits. We are downsizing from 8k to 5500 ft2. Yes, it’s still big but every space works (hopefully) for our family of six. And we have put a huge emphasis on lovely materials rather than cavernous spaces. I would love to read her “life” book as we move in and start a new adventure on our farm. I wonder if the house has been renovated since it was built? To be almost 20 years old, it looks as fresh as if it were built last year! 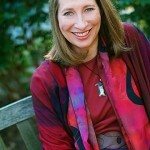 Love her ideas, and I think they are finally finding their way to the marketplace. I’d say 80 percent of the new homes I work on now do NOT have a formal space at all. 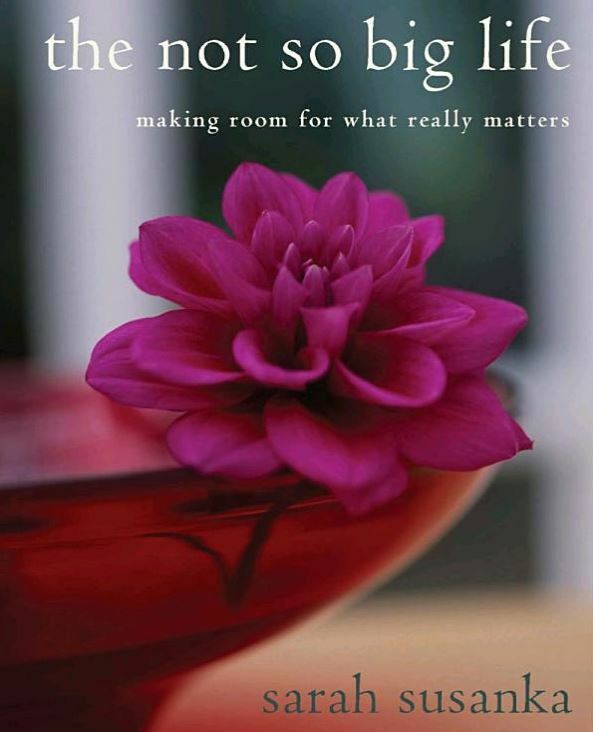 And in many renovations those old formal rooms are becoming part of a larger kitchen, or a home office. I adore the concept and how it has been translated into Ross Chapin’s work, burgeoning pocket neighborhoods (like Inglenook Carmel and Zionsville), and the cottage builders popping up; but, I actually think the NSBH featured screams 90s in a not-so-good-way. The exterior is gorgeous (that gazebo is amazing!, but I wouldn’t buy it. I’d much, much rather a tiny Ross Chapin cottage or one by the Perfect Little House Company or The Bungalow Company. Or, even better, an old shotgun house in New Orleans! I totally agree! I love Ross Chapin’s cottages. They are absolutely charming! I, too, love the Ross Chapin homes! I think he uses a lot of her principles, but scaled down and right-sized. I’d love to live in one of his pocket neighborhoods…Carmel or Zionsville (but I think I prefer Zionsville!). Julia, I think I sent you info on these a few months ago! I, too, like the concept of “less is more” these days after having had a bigger house when we had young kids. This being said, I consider the house above to be pretty darn big! It’s too contemporary for me, as well. I’m sure for those who like that look, it’s pretty amazing and I bet it sells quickly. I love the scenery and natural light, but prefer something more traditional. Thanks for sharing! Not a fan of all the wood in this house. And I find it very mockable to use this house, which has over 5,000 sq ft, in a book about *not* huge houses. This is a mansion. It might not present itself as such, but it still is IMO. When you need to buy furniture to fill space, then it’s too big. While I like many things about this house, it’s still a big house in my mind. Have to wonder what she gave up to get a “smaller” house with quality! My husband and I are building our “final” house on a one acre lake lot. We loved our former house (except location) so much, we decided to build it on the lake, with minor changes. We actually had to add sq. footage to comply with the development requirement of min. 1800 sq. ft.!! There are only two of us, and we are retired, don’t need much house and don’t want to keep up with a large house. We met one of the neighbors, who has an almost 3000 sq. ft. house, and is in his 70’s. It seems crazy to us that you even need all that room when you are that age, but we aren’t them. Our house is the biggest we’ve ever owned, and have managed to raise two kids and now have a family of 10, plus extended family, and never really needed more space. I just never understood the McMansion need, unless for a status symbol, and I’d rather spend that money on a vacation home! Hope the buyers of this place enjoy it, it does have a great setting and style. I agree with the concept of less square footage, better details. But I also agree with others that the house shown is huge to most people. It certainly is to me. My house is 2,000 sq. ft. and unless we’re having a party it is really a little more than my husband and I need. I do like the extra care to details and how the house it will be used, though. Whenever I see the giant vinyl boxes with no yard, I imagine that those people must spend their whole lives inside, going from work to air-conditioned car to garage to inside every day. Maybe that’s why they don’t care how ugly their houses look from the outside! 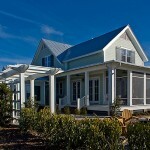 While there are elements of this design that I really like, to me this feels more like a cottage than a home. I think all the wood and beige tones would wear on me after awhile. If that is the original kitchen, it was certainly ahead of its time. The same could be said of the bathroom. I agree with what others have said….this is not small, or even smaller, in my opinion. I can think of some other titles that would be more appropriate, such as The Thoughtful Home, The Efficient Home, or The Practical Home. I have never wanted a McMansion, and I feel sort of sorry for people who live in them. I live in a charming little village, whose inhabitants mostly commute to the city for work. We don’t have malls or cinemas or box stores, which we love. Now that these huge tract homes are being built just outside of town, there is talk about bringing in some of the aforementioned “conveniences”. The locals are not impressed! i agree with the previous comments that over 5600 square feet is not a small house. but that said, people with the “macmansion” mentality would have doubled the square footage and skimped on the materials. i love the quality & “real” products they used in this home. might not be totally to my taste but it is lovely & is thoughtfully made. of course it could be updated a bit, but the basic design & the materials do stand the test of time. 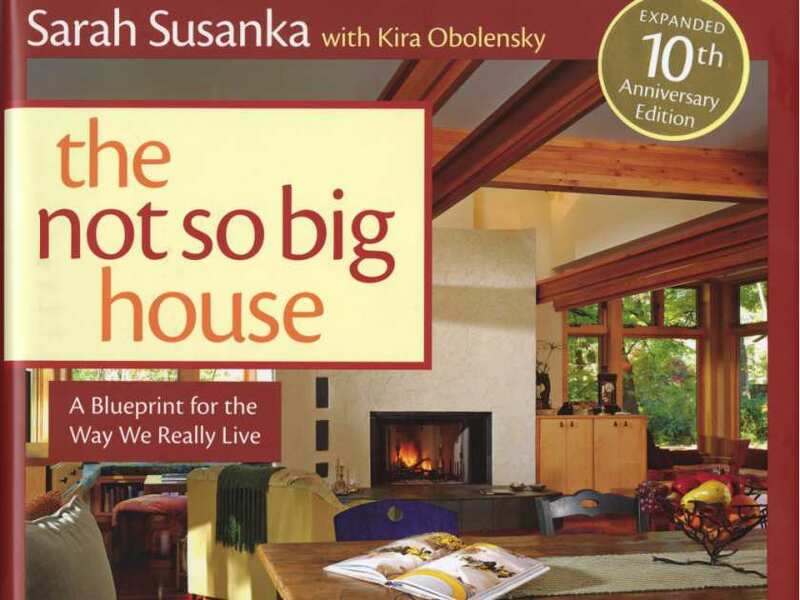 I’ve been a fan of Sarah Susanka since this book first came out. It might have had something to do with the fact that I was living in a 900 sq. ft. cottage at the time, with a husband, two small boys, and a black lab puppy. Today, we live much bigger, but not necessarily better. Can’t wait to downsize one day in the future! I have most all her books, and I really like the concept of a better designed, more artfully crafted house to meet your individual and family needs. I really abhor look-alike mega box houses on tiny lots. I know that sometimes that is what’s available to people with certain criteria in their area. I also realize how builders for the last twenty-five years, as land and infrastructure costs got to be the most expensive part of development, have made their profit margins by building bigger and bigger houses on smaller and smaller lots. I hoped that after the recession more reasonable approaches would prevail with a return to more cottage scaled houses (of various sizes) and efficient structures, as well as better affordability. I have seen some of this in our area. I don’t think most people, especially families, want to live in a tiny home, but there is some appeal to a beautifully crafted very small space. As for this house, I can admire the design and craftsmanship and sense of space, but I agree with others above that it seems huge to me. It’s just a different version of a high end custom design that belies the title. Yes, it may be smaller than the owners originally intended for an architect designed home, but it doesn’t seem to be an answer to builder mass produced housing. As an aging baby boomer, I don’t want to be saddled with a large house, even if I could afford one. However, a family member and spouse, both older than I, recently bought a house bigger than this one on a small lot for the two of them. So, I guess it takes all kinds! Beautiful home. Pleased to see soapstone in the kitchen! Also love the flooring in the gazebo and music room. It is quite a large space, but the designs and materials can be used in homes of any and all sizes. I love EVERYTHING about this house, from architecture to furnishings to setting. I’m a huge fan of Frank Lloyd Wright and Asian inspired design and this is a perfect reflection of those influences. I’m also a believer in “less is more” and only inhabiting dwellings that are justified by necessary requirements. While I understand yours and the architect’s statements (or explanation,) I have to wonder what the justification would be for living in over 5,000 sq ft. It also seems to me, that to follow her philosophy to it’s logical end, is she saying that if she hadn’t cut back on size and instead, focused on upgrades, that the house would have been even larger? 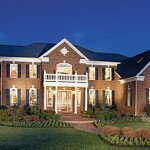 Regardless, a house exactly like this (albeit a third of the size) would be my ideal! Why do I feel that the owners are selling this house in order to downsize… to a truly not-so-big-house? Lol! You can really see Frank Lloyd Wright all over her inspiration. What I like about his “school” is that the architecture is a compete environment by itself- the details and capturing of light and materials speak for themselves. There is no need for adding color and whatever the current design fashion is. You can furnish the interior with classic lines and neutral colors without it being boring. I lived in Oak Park and had the opportunity (via clients) to go inside his and his student’s houses and even lived in one for a few months. The flow and light were amazing. Very peaceful.